Come join us in the Appalachian Piecework Textile Studio garden this September! Two courses will be taught by Nellie Rose, a practicing textile artist and clothing maker from Thomas, West Virginia. 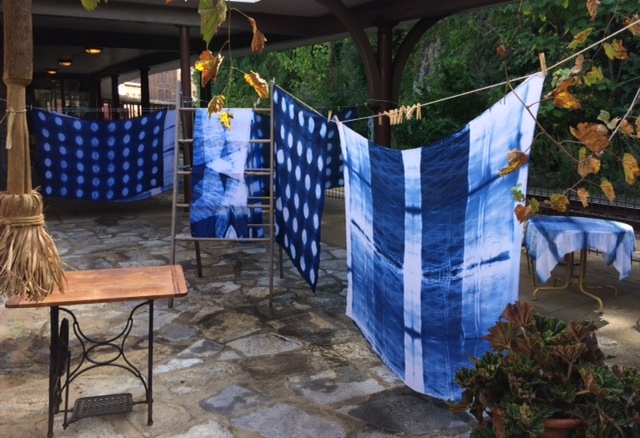 As an apprentice in Japan to Hiroko Harada, a world-renowned shibori artist and indigo-dyer, Nellie Rose had to first develop her skills by forming a foundation with traditional techniques. We want to share these with you! We'll set up an indigo dye bath together and then we'll experiment with techniques that involve sewing, folding/clamping and pole wrapping. Indigo is an expansive rainbow that we get to dive into and play with. When it comes to indigo and shibori we can get as nerdy and technical as you'd like. Then we will take it past tradition to where you modify the technique(s) you learn to create your own unique textile pieces. This is a beginners course; no previous experience required. Folks with prior experience will be able to dive a bit deeper. We will provide the tools, indigo dye, and fabric with a $45 materials fee. Space is limited. Please inquire via this contact form .